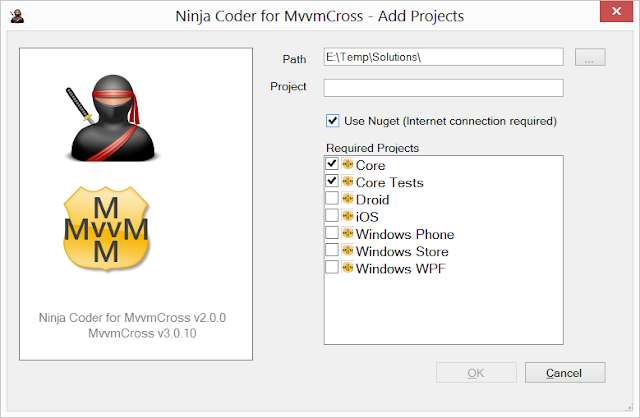 Version 2.0 of the Ninja Coder for MvvmCross is now available for download from the Visual Studio gallery. Well that's the good news, the bad news is there isn't that much new functionality, but what we do have is options, hopefully some very useful options. I always wanted the Ninja to work on a train with no internet connection so everything needs to work from the local machine. The no connection mode of operation will always be the cornerstone of the Ninja, however to progress the Ninja to where I would like it to be it is going to need an online mode of operation. Having an online mode of operation means its easier to install MvvmCross updates - in an offline world I would need to package up a setup program to be installed onto the local machine. 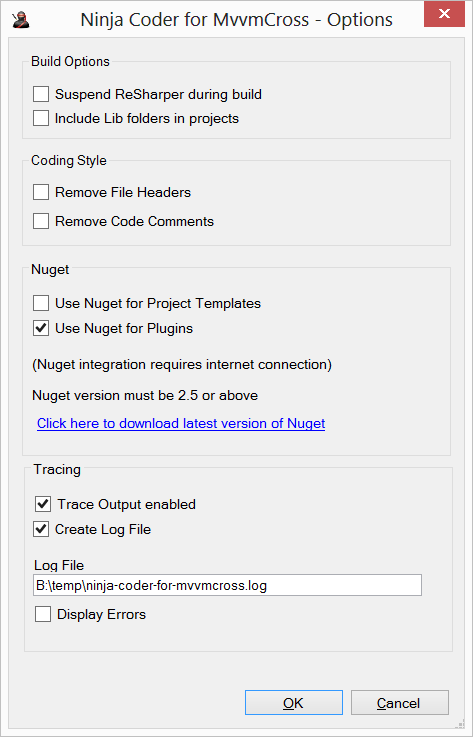 MvvmCross solutions can be created via Nuget and I have know taken the decision to support both Nuget and offline mode in the Ninja! For some people this is a big deal, for others not so. Who would have thought one little checkbox would cause me so much work!! 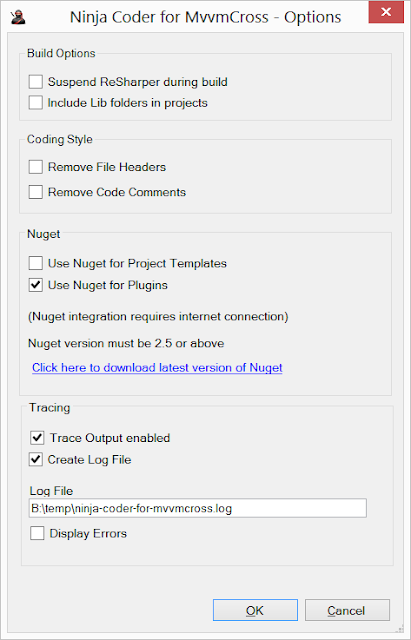 download the relevant code and assemblies from the Nuget service. The Nuget service approach is quite a bit slower than the offline mode so I would recommend not using the Nuget option . 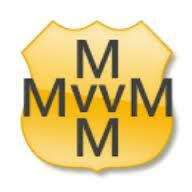 I will try and keep the offline mode of operation update with MvvmCross updates as I can. Some people like the fact that they can be notified if the MvvmCross nuget packages have been updated by @slodge and allows them to update very easily. Moving to some new options that have been implemented with version 2.0.0. Below we can see the new options screen in the Ninja. ReSharper can get in the way when building MvvmCross solutions especially on slow machines so an option has been created to suspend ReSharper while the solution is created (and will be restarted after!). The option to include the lib folder (and its contents) in the solution is now an opt in option for those that like all their files in the solution. Coding Style is always a contentious issue - Everyone things that the way they code is the way to do it. Removing file headers and the default xml comments are both options. Coding style may be more configurable in the future, it will depend on community feedback. Options to set the defaults for Nuget also on this screen.